One problem to consider is the earbud earphones that come with your smartphone. 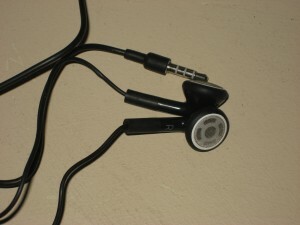 Earphones are often subject to physical damage and as such I am often on the lookout for economical alternatives. The one I am looking at now is an unbranded (no-name) pair of earbuds from a discount store. At 5.99, its not exactly dollar store territory yet its cheap enough to experiment with. These earphones have a slightly tinny sound quality, which is not too surprising given the price. It’s slightly better than dollar store models I’ve used. I wasn’t expecting much on the sound but what was really disappointing was the low volume. On music or spoken word podcast it wasn’t too bad but on phone calls it was especially disappointing. Unless I was in quiet room I couldn’t hear a thing. The person on the other end also had trouble hearing me but not as much trouble as I had hearing them. There is nothing here for me to recommend or not recommend since I couldn’t find any brand name or manufacturer. What I do is provide general thoughts on this class of earphone. 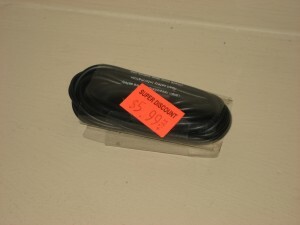 The type you may buy maybe of better quality but it is was poor enough to recommend avoiding a purchase if you can. You may only want to take a chance on this one as an emergency replacement. The lack of volume on calls prevents me from giving them a better overall score.